So we're at the end of July and on the plot we have had some winners and losers! To get the bad news over with first. As I've mentioned previously our garlic has been pathetic. It was started off in pots in our cold greenhouse and was full of promise when planted out but from then things went downhill and the result is just a few small bulbs. We are also preparing ourselves for a disappointment in relation to our carrots; they just don't appear to be growing at all well. This is a major blow as we usually have a fantastic crop. Rhubarb too has suffered in the dry conditions - we haven't harvested many sticks this year - we'll have to hope that the roots recover once it gets a good downpour or two. Then we have the OK but could do better crops. We did manage a crop of cherries but didn't gather as many as last year - such a shame as the cherries are delicious. The sweetcorn isn't as far on as it was at this stage last year but the first lot of plants are beginning to flower so it's fingers crossed. French beans haven't produced much of a crop yet but we do have more plants in the wings ready to plant out. Potatoes have to go into this category - the tops just don't seem to have grown at all well so we were prepared for nothing to have developed below ground. The first potatoes to be lifted have been a surprise as the crop has equalled in weight what we managed last year although we have gathered fewer potatoes they have been larger. Time will tell whether the other varieties still to dig have been as successful. Plums and gages are loaded with fruit although the individual fruits seem smaller this year - we have started picking our yellow - Oullins Gage - plums but I'm saying nothing more until more fruit ripens and is safely gathered in. Apples and pears look promising at the moment but there is still time for things to go (pardon the pun) pear-shaped! Tomatoes are beginning to turn red but many flowers still have to set fruit - will they won't they? Then there is always the chance that blight will hit us. Our new Marshmello strawberry plants which at the moment are giving us a supply of huge juicy fruits. 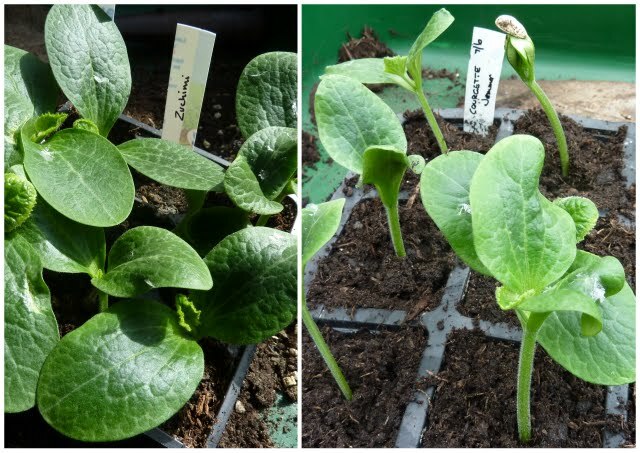 Squash are beginning to set fruits but how big will they manage to grow. Brassicas are growing well at the moment but we have been here before. Hopefully the cabbages will be fine but the big question is will the sprouts continue to grow this year? Then we have the successes. I don't really like to count chickens but at the moment it certainly looks as though our star performers will be the onions and shallots - they seem to have revelled in the conditions. The tops are just beginning to go over so now we need to hope nothing comes along to spoil things! Our faithful old redcurrants have been loaded and now the blackbirds are benefiting from the removal of the netting. We have had what we want and given lots away so it's only fair that the birds should have their share. The blackcurrants that have fruited for the first time this year, alpine strawberries, tayberries, gooseberries, jostaberries and raspberries have provided us with plenty of soft fruit. Early cabbages are doing well - we have already harvested a few. 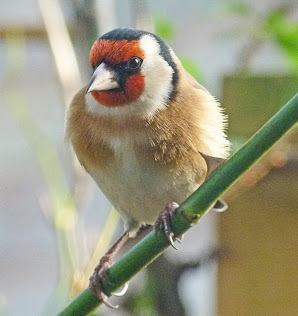 All my regular visitors know how much we enjoy watching the birds in our garden. Well this little bird seems to be enjoying itself in one of our bird baths. When it comes to courgettes - we always over-rule our head! Each year at this time - I guess along with many other gardeners - we make a resolution that in future we will not grow as many courgette plants. As we like to grow both green and yellow varieties it means buying two packets, (or even three if we can't make up our minds), each containing about ten seeds. Then there are years when we end up with a third packet courtesy of one of our gardening magazines! All good intentions to limit courgette production fade at seed sowing time when the “what ifs?” creep into the equation. What if the seeds don’t all germinate? What if something munches some of the seeds or seedlings? What if they germinate and then die off - especially when compost seems so variable and some seedlings fail to thrive in it? What if some just don’t grow when planted out? If you grow courgettes at all you must have been there. The seeds all end up being sown - after all you can always give some plants away or even throw some away (well maybe not). They all grow and produce healthy plants - even the ones that looked a bit dodgy when planted out rally. 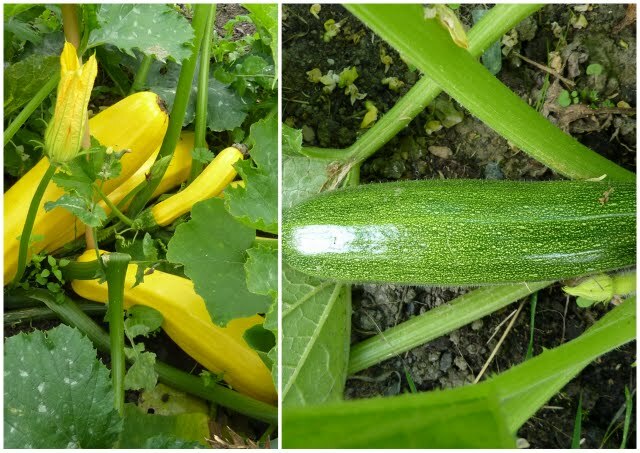 You give some away - that is if you can find someone who isn’t in exactly the same position as you or someone who hasn’t been grabbed by someone else and persuaded to adopt a courgette plant! So you end up with a mountain of courgettes again. Some race to the marrette stage before you even spot them. You even end up with some doubles! Then it's a case of who do I know that likes courgettes and doesn’t grow their own? Anyone you come into contact with during the next month or so will be fair game! With a courgette glut imminent I have been scouring the Internet for recipes that use courgettes and have come across a few that I will try including one for a courgette cake. 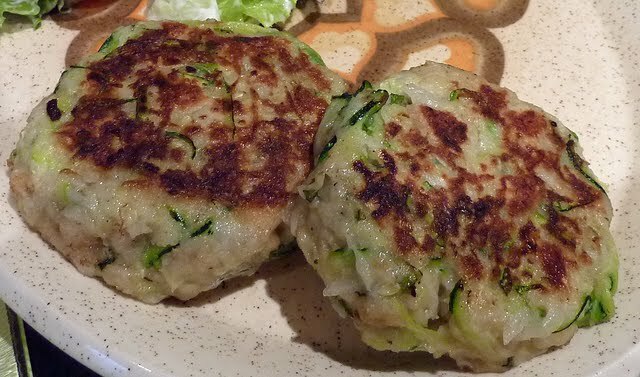 Many courgette recipes also call for tomatoes and as we haven’t yet reached the tomato mountain stage - if we ever do - the first recipe that I’ve made is for Courgette Burgers. It's not exactly the same as the recipe on the Internet but are they ever? I've come up with a few variations and so far we have had one flavoured with fresh garden mint and another with ground cumin. Last year we enjoyed Courgette and Summer Vegetable Gratin and will no doubt get round to cooking it again this year when we start harvesting runner or French beans - that recipe is here. I've other recipes (not necessarliy courgette related) accessible from the recipe tab at the top of the blog. I’ve collected quite a few more recipes to try - there are lots to choose from on websites such as The BBC Good Food website and The Good Food Channel website but there is nothing to beat a personal recommendation. If you have a favourite courgette recipe then email me a link to a website or blog post and I'll add it to the page I have set up accessible from the sidebar. 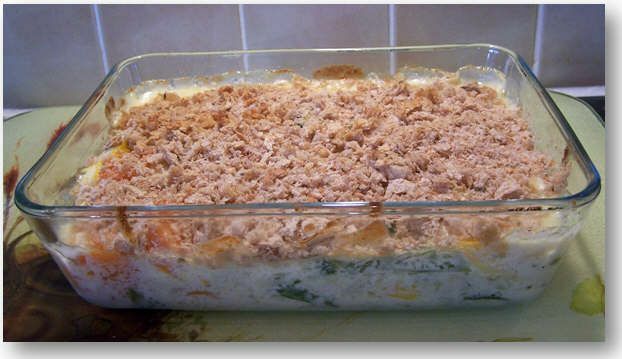 If you have a photo of the recipe on your blog please let me know if you give permission for me to use it! If the recipe is short then you could add it to your comment. Not one for the seed collectors. If you read Martyn’s Saturday post you will know that this week we harvested our very first red tomatoes. One was a cherry tomato called Gardener’s Delight which has a delicious sweet juicy flavour and the other was German Red Strawberry. If you look at the photograph that Martyn posted on his blog showing this tomato sitting alongside a newly picked strawberry, then you will understand why it has been given this name. It isn’t that it tastes of strawberries and why would we want it to? As we only had one tomato of each variety both were cut in half so that we could have a taster each. We hadn’t grown German Red Strawberry before so didn’t really know what to expect. It’s a heirloom tomato described as an oxheart variety. The catalogue description claims that it will produce very large tomatoes but this one was much smaller than expected. We weren’t really disappointed as to be honest we had forgotten this claim. As you can see from the photo the tomato is very ‘meaty’ rather than juicy but we liked the flavour. It is almost seedless too - well this one was! The few tiny seeds that were visible were confined to the small cavity at the top of the fruit. I wonder whether the seeds develop as the tomato becomes over-ripe, otherwise how do they collect enough seed to sell? As I wrote in an earlier post, I decided that I would plant clematis to grow up the willow screen at the back of a border that we are renovating. 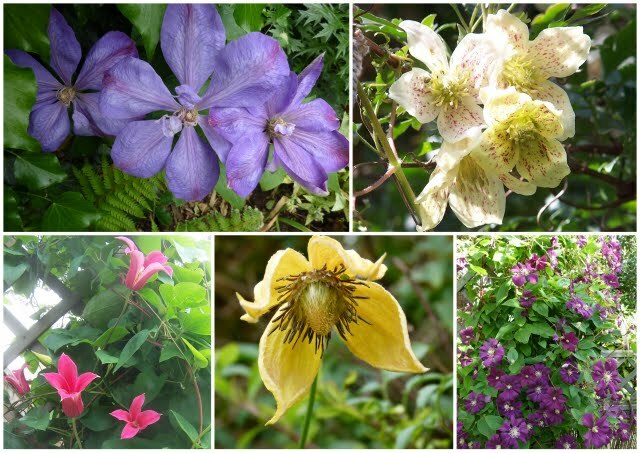 Browsing the Internet I came across a clematis nursery which is only about half an hour’s drive from us in Doncaster. One thing that I really liked about their website was that it allowed me to search for a suitable plant using all sorts of different criteria such as colour, height etc. As I wanted clematis that would be happy in the shady bed under our crab apple tree I searched under aspect, for plants that would tolerate shade. If I wanted to give the plants the best chance of success I didn’t want to choose one and find that it needed full sun. Also I didn’t want the disappointment of finding one I really liked only to find out that it was unsuitable. My search came up with 65 possible candidates!. This was narrowed down by browsing the thumbnail images for ones which had either white or blue flowers to suit my chosen colour scheme. I wanted colours that would light up the shady area. I relented a little and allowed pale pink to creep in as one variety that I really liked - Andromeda - had a pinkish stripe. I rationalised this by deciding that a touch of pink would stop the border from being too boringly white! I managed to end up with a short list of five varieties Andromeda, Dawn, Fuji-Musume, White Moth and Alpina Willy. As the nursery was so near to us we decided that we would pick up our plants rather than having them delivered and so I emailed to ask about visiting arrangements and to check that my choices would be OK for the position in the garden. 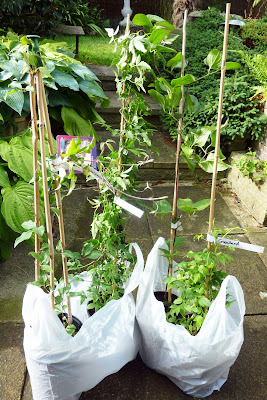 The blog came in handy as the owner looked at the photo of where I wanted to grow the clematis and remarked that I'd made a good choice and that all five would fit in nicely - well I suppose he would say that wouldn’t he? Anyway that suited me and so I asked to order all five. Unfortunately it turned out that they had sold out of two varieties White Moth and - wouldn’t you know it - my favourite Andromeda. An couple of alternatives to White Moth were suggested and I selected one called Snowbird but I decided to wait for a new stock of Andromeda! I was surprised to be asked if I wanted to collect the same day which of course I did! Martyn made a start by attaching wires to the screen so we can train the plants when they start to grow. To give the plants the best start in life we followed the instructions for planting to the letter. Deep holes were dug and filled with a mixture of soil, compost and fertilser. The lower leaves of the each plant were removed so that we could plant deeply about 12cm (5”) deeper than the plant was growing in the pot! The pieces of drainpipe that you can see in the photos have been set in place so we can send water directly to the plant roots. Now I am impatient for them to grow and look fantastic - I hope. William Kennett, Clematis cirrhosa (which flowers late winter/early spring) Princess Diana (flowering now), a variety of tangutica (also flowering) and one that I have had ages and can't be sure of the name of but I think it's Etoile Violette (it's also flowering now). We also have a couple that I don't seem to have photographs of Miss Bateman and another alpina variety. I grew tangutica years ago, from seed and it is very rampant. 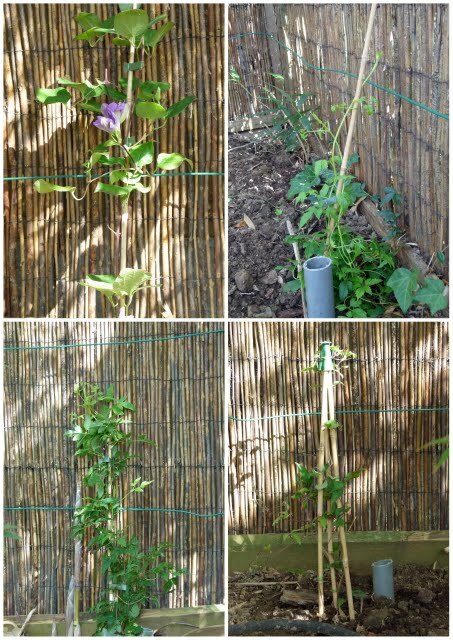 I only just found out when I was reading the clematis website that I should have been pruning it back really hard - I haven't been doing which explains it's attempts at garden dominance. Early next year it's going to get a shock! All that just goes to show that I guess we rather like clematis! Can you ever have too many strawberries? As regular readers may remember, this year we created a new strawberry bed. We previously had three small beds of strawberry plants but these had really come to the end of their productive life and the beds had become impossible to keep weed free. The old beds had been left in place just in case we could eke another year of berries from them but they have only managed to produce a few very small fruits which haven’t even been worth netting to protect from birds. They have welcomed being allowed to forage amongst the weeds. The old beds are very overgrown - one problem was trying to keep weeds - especially couch grass - from strangling the plants and taking over. It’s now difficult to find any plants amongst the thick weed growth and the beds will soon be cleared. We could just do with a bit of help from some decent rain to soften the hard clay baked soil. We were determined to try and avoid letting our new strawberry bed suffer the same fate. The new bed is divided into quarter sections with a different variety of strawberry planted in each section. Each plant has been allowed more personal space to ease weeding in between plants. I should be able to hoe without causing damage. As mentioned in an earlier post we have used a biodegradable mulching fabric around the plants to try and prevent weed seedlings germinating both from under the black mulch and from the seeds deposited by the layer of straw. Ideally I would have liked to avoid using straw altogether but the mulch is too light to stay in place without some sort of cover. I didn’t want to use a permanent weed suppressing fabric as I want to be able to get to the soil during the non-fruiting part of the year. More about that here. The mulch is working very well although weeds still find their way through the gaps alongside the strawberry plants. I’m trying to keep these in check by pulling them out before they become established and hopefully we will be able to remove the straw before the mulch fabric disintegrates to avoid spreading too many new weed seeds in amongst the plants. 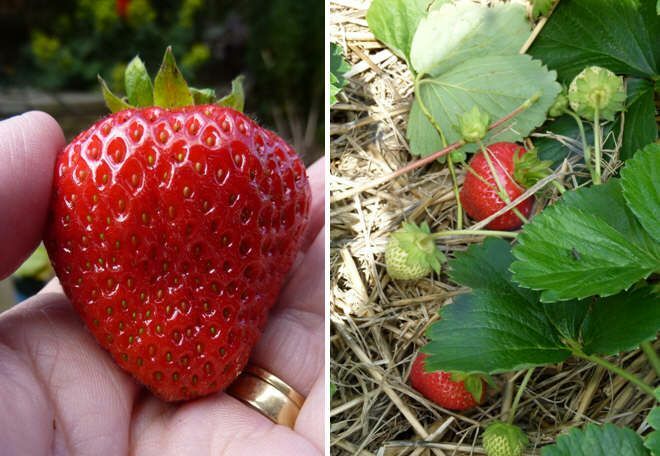 Another problem in our old strawberry beds was that the different varieties of strawberries became mixed up meaning that it was impossible to propagate new plants with any certainty about the variety. The idea of keeping each of the four new varieties in a separate section means that shouldn’t be a problem in the future. This year my intention was to cut off all the runners sent out from the plants before any plantlets formed. In this way I’d hoped that all the vigour would go into building up the plants strength so that next year we could look forward to a bumper crop. That was my plan but the plants had other ideas and have been so desperate to reproduce that I just haven’t been able to cut the runners off fast enough and some of the runners had managed to produce babies in spite of my efforts to stop them. As plantlets had managed to sneakily develop it seemed silly not to make use of them, so when I last went around the bed removing runners I collected the ones that sported plants that looked as though they really wanted to grow. I worked on each of the four strawberry varieties separately and tied each batch of runners into a bundle, each named with a plant tag. These were popped into a bucket of water to bring home to plant. Getting them home should have been the easy part but we left the bucket outside the shed and had to go back for it. Once home each batch of plantlets was set into a module tray cell, watered and left on the greenhouse floor. The plants already had embryonic roots and so with any luck should soon start to grow. I’ve never followed what is supposed to be the correct way to root plantlets which is to peg them down into a pot or into the ground and allow them to root before removing them from the parent plant. It’s always worked my way. I figure my way takes less energy from the parent plant and I can’t really see how the young plant can get much benefit from being attached to a parent that is sending our runners like there is no tomorrow. If they grow the young plants will provide a back up to fill any gaps in the bed that may be created should a plant not survive winter. If they are not needed for this then we will pop them in tubs and keep them in the garden alongside the two tubs, of a fifth variety, that are already there. More strawberries can’t ever be a bad thing can it? We didn’t expect lots of fruit from our new strawberry patch this year. 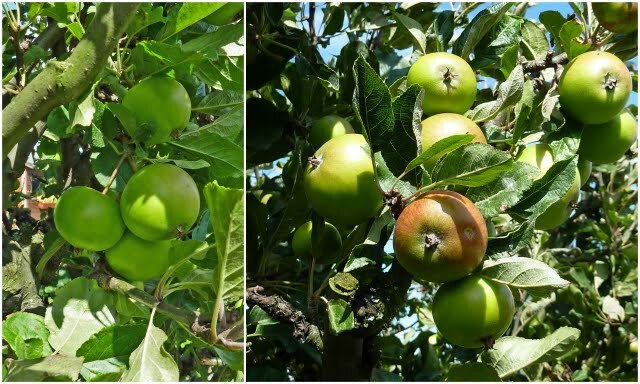 There seems plenty of unripe fruit on the plants but each variety has already produced enough for us to know that all five varieties produce delicious good sized fruit. We carried out a taste test to try to decide which variety has the best flavour but it’s almost impossible to split them. They’re all absolutely delicious! If you are interested there’s lots more about how we grow our strawberries here. I've mentioned earlier that the redcurrants that give us such a great crop were inherited when we took over this bit of our plot - well we also inherited four apple trees. Originally they had been planted as cordons but during the time that they’d been left to fend for themselves, amongst weeds as high as they were, they’d had other ideas. When we rescued them they were in a sorry state. Some of the wires up which they had been trained had cut into the trunks and the only alternative was to cut the wires and leave them embedded. 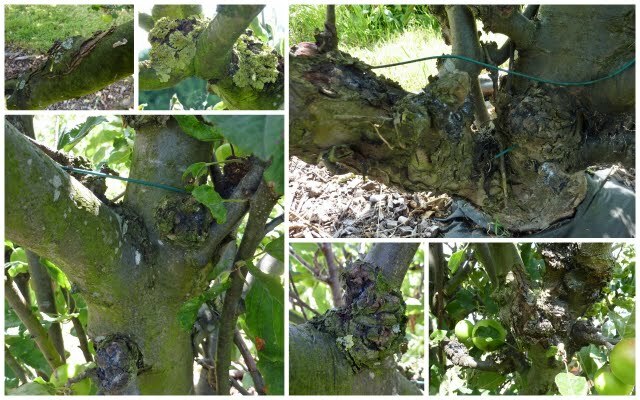 The trees were also badly affected with canker leaving branches and trunks very gnarled and distorted. I suppose advice would have been to chop them down, maybe it still would be if we were to ask an expert, but we didn't. A severe pruning was inflicted on them to bring them back under control and then it was a case of waiting to see what would happen. The cankerous lesions are havens for woolly aphid so in our shed we have a special tool for dealing with these pests. 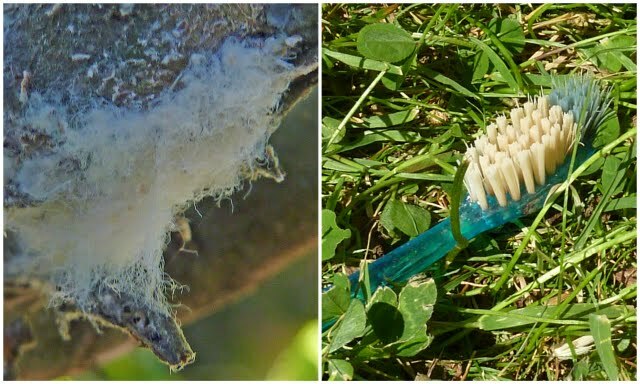 Whenever I spot a clump out comes an old toothbrush and I go into battle mode, scrubbing off as many as I can manage. Effort to protect the trees from as many pests as we can is well worth the effort as they thank us by providing us with a good crop of what may not be the best looking apples in the world but then again it’s not always the best looking that is the tastiest. Not only do we get to eat apples straight from the tree but we also have a plentiful supply to stew and freeze for use later. Each year the trees still make a bid to revert back to their semi-wild state and need some serious pruning and no doubt at some point these trees will cease production so we have planted new young trees to take over but in the meantime the geriatric apples will stay. 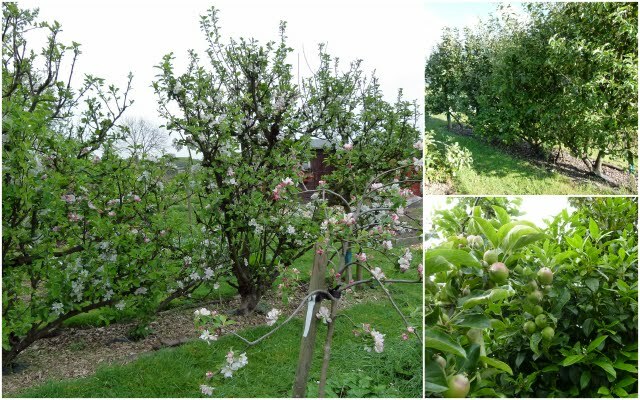 For a quick peek at how the apple trees in the garden are faring click here. These are also old cordons that have decided to throw off their shackles and become trees despite being cut down to the ground a few years ago. Such was the trees determination to grow! We no longer have to wait for one young fruit tree has produced its crop although not a prolifically as last year! These cherries - Summer Sun - were not fully ripe here when we picked them but, off the tree, they ripen well to a dark red and are now just perfect for eating! 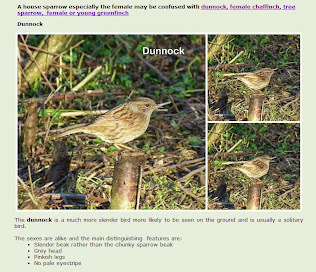 The blackbirds could only look on enviously! I've spent lots and lots time searching for the right sort of statue to create a focal point in one of the borders viewed from our patio window. 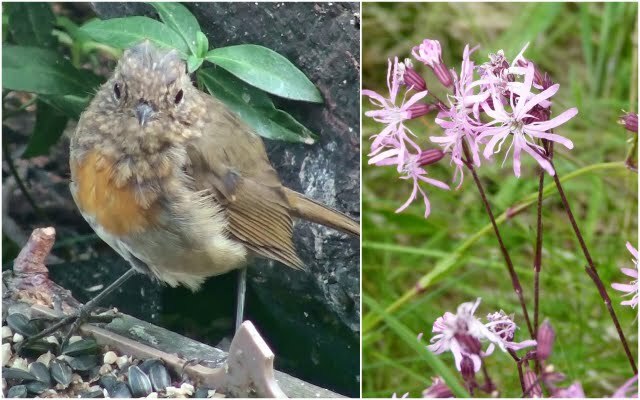 I searched garden centres and the web and just couldn’t find one that would look right in our garden.I mentioned in an earlier post that we had seen a bird bath that we liked in a local garden centre; that post was back on June 13. A bird bath or a sundial seemed more us somehow but there would be no point having a sundial in a shady spot so a bird bath it would be. Since then we have been umming and arring. Would the bird bath fit in the car or should we have it delivered? Was it really what we wanted? Could we find it cheaper on the internet? Well all the prevaricating has paid off! The garden centre where we saw the object of our desires runs a membership scheme. For a £10 yearly subscription we are entitled to 10% discount off anything we buy. We also get a couple of free drinks each month and a free meal every three months. Just taking advantage of the free drinks and meals we easily recoup the £10 membership so have been members now for a year or two. Anyway to get to the point - just as we decided that we could transport the bird bath in the car and were planning to go buy it we received an email saying that for three days the garden centre were giving 20% discount to members on everything purchased; so you see the umming and arring worked to our advantage! We now have our focal point but as I mentioned in my earlier post this border is now being completely renovated. Most of the planting except a couple of bamboos has been completely removed and the two bamboos have been pruned severely leaving only about half a dozen canes to each plant. This left us with a fairly blank canvas. As usual with us our plans have snowballed. We had always fancied the idea of planting an acer but had never really had a position available where we thought it would be happy. Then recently on a gardening programme - it could have been the coverage of the Chelsea flower show - they mentioned that green leaved acers would grow in a shady situation. That was enough to send us off to a local nursery where we found a couple of acers that we liked which seemed likely candidates. We decided to go ask for advice on which of the two varieties would be happiest in a shady position which was easier said than done. As is usual, for acers, both had unfamiliar Japanese names which we needed to be able to quote in order to ask for a recommendation. (We could have done with Fer’s help at this point!) We each tried to memorise one of the two names and headed to the shop. After all that effort, advice was that either should be OK. We chose the one we liked best - Acer Palmatum - Osakazuki. Earlier in the year I’d bought some perennial plants which were going to be planted around the base of the ‘statue’. (Hellebore Niger, Brunnera - Jack Frost, Pulmonaria - Diana Clare, Omphalodes - Cherry Ingram and Lamium - White Nancy). These have been planted out in temporary positions so they don’t become pot-bound whilst waiting for us - well Martyn - to cut back more tree branches and decide which other plants we want to grow. 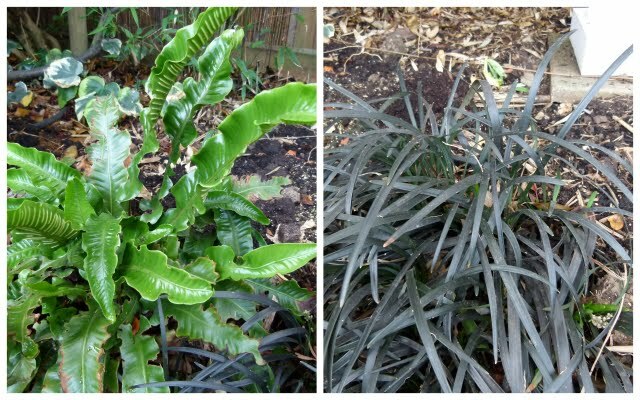 Two plants that survived the big clear-out were an Asplenium fern and a black leaved Ophiopogon these will stay although may be moved. 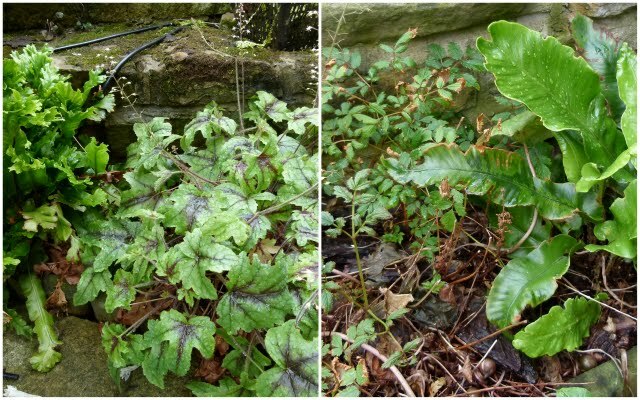 Elsewhere in the garden I have two more Aspleniums, a carpeting astilbe and a small tiarella that I am thinking of moving to join them. On the TV coverage of the Hampton Flower Show they implied that a white flowered hydrangea would do well in shade - can anyone confirm this? I’m thinking of planting some shade tolerant clematis up the screen around the border, as the removal the large fatsia and most of the bamboo canes that dominated the border has left the screen totally exposed. The clematis will need to be pale colours so the flowers will hopefully light up the area. Varieties being considered are Andromeda, Dawn, Fuji-musume, White Moth or Alpina Willy. I can maybe fit in three plants (more decisions) maybe a blue flowered variety behind the bird bath for a bit of contrast. I'm mainly going for a white and blue theme to lift the shade. Any other suggestions? And now for something completely unrelated! Can you say what connects these two photos? Has it been the year of the garden pea for you? We don’t appear to have had great success with garden peas and mangetout this year. It has been far too dry for them to thrive. We pulled our first lot of peas this week which is around the same time as we did last year but the harvest is well down. One variety - Feltham First - has so far produced less than a third of last year’s crop. There didn’t appear to be many more pods left to develop but maybe I will prove to be wrong and more immature pods are lurking amongst the leaves. The mangetout - Carouby de Mausssane - have yet to produce any flowers so I'm not particularly hopeful of a decent cropping (if anything) from them. It’s such a shame as we really love our garden peas. We have a second sowing coming up at the moment so we will have to just hope that they do better. Peas may not have thrived but it seems that for one pea pest the conditions have been ideal. Quite a few of our pea pod show evidence of being attacked by pea thrips or thunderflies. These are tiny sap sucking insects which are supposed to be more common in the south of England but the warm, dry conditions that we have experienced this year have suited them. Heavy rain will wash them off plants but there hasn't been much of this in evidence in our area this year. The peas inside pods damaged by thrips are fine to eat but as flower buds can be damaged badly infested plants may fail to produce pods - I wonder if this is happening to our mangetout? As it is if the pods are damaged by thrips they will be useless to eat. As I sat podding the peas I did notice that less had been affected by pea moths. I came across only a few of their caterpillars. Neither do I think our plants have been as affected by pea and bean weevils as they have been in past years. These are responsible for the notches made in the leaves of plants. It seems it’s a case of what you gain on the roundabouts you lose on the swings. What has happened to your pea plants this year? Fortunately we are harvesting other crops - for a record of our harvests so far click here. For just our July harvest click here. Some of you may vaguely remember that I mentioned that I was going to try to grow some cyclamen from seed. I bought a packet of indoor cyclamen called Laser and also bought a packet of an outdoor variety called Coum. By 30 May, six of the eight seeds sown had germinated which was amazing enough but in the end all eight seeds germinated. When I first sowed the seeds I’d have been happy if I had only ended up with one plant. On 31 March I sowed the seeds in John Innes seed compost after soaking them. The instructions said soak in tepid water for 24 hours but I have no idea how I was meant to keep the water tepid for that long. It was tepid when the seeds were popped into the water but hardly when they came out. Another problem was that wet seeds tend to stick together and to fingers so maybe I should have dried them on kitchen paper before sowing. Light apparently helps the seeds to germinate so they were not covered in compost just a layer of vermiculite. The seed tray was placed in a polythene bag as the instructions dictated that everything had to be kept moist. The seeds were then placed in our Indoor Growing Garden. A newly germinated seedling sends up just one cyclamen shaped leaf and then tends to produce a tiny corms before more leaves are produced. Being sure there were no other seeds waiting to germinate I decided to pot the seedlings up. Now I have eight small cyclamen plants planted in fibre pots. The pots have been placed back under the grow light in the spare room so that I can keep a close eye on them. As for the cyclamen coum - there were far more seeds in the packet but so far only three have germinated. As this is a plant that flowers from late winter into early spring I wonder whether the seeds will take longer to germinate so I’ll just leave them and see what happens. Funny I’d have been happy with three seedlings when I first started but now I want more! End of June review including the tatty bits. I thought things on the plot were really behind this year so I took a look at the photos taken around the same time last year. Surprisingly things didn't seem to be that different. Maybe the weather early in spring has made me think that we are further on in the year than we are! 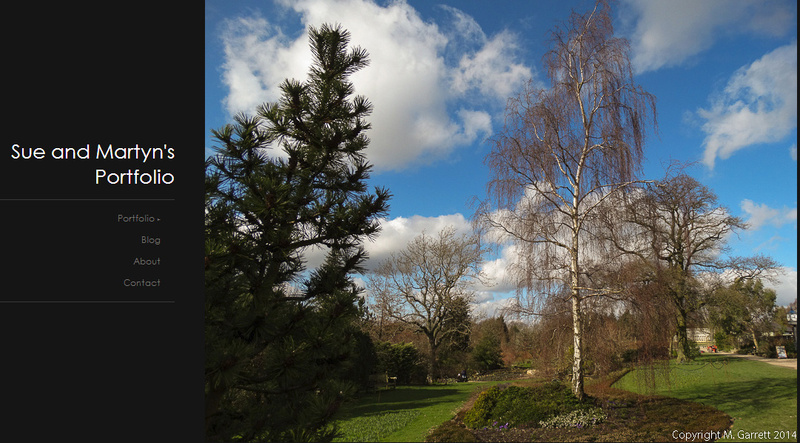 Last weekend I decided to have a wander around the plot taking lots of photographs - no tatty areas have been spared. The album below gives a general idea of how things are looking at the moment. As you will have seen if you managed to watch the album all the way through - there are quite a lot of photos so you could be forgiven for giving up - there are still areas that need attention. The old strawberry beds, that were left for just another year just in case our new plants didn't produce, will need digging out completely. There is absolutely no point trying to weed around the plants as weeds and plants are too closely entwined. Also the clay soil is rock hard due to lack of rain. The plants were really planted too closely together to allow for hoeing which at least would have kept the soil workable. We have a flower bed which acts as a sort of boundary fence along one edge of out plot. Now the poached egg plants, that were acting as ground cover, have died down this needs a general tidy up. I have started by cutting back the dead stems of the centaureas (cornflowers) as they are producing new growth from the centres and will flower again. We have another couple of beds that have become overgrown that also need dealing with. One will become our winter brassica bed and the other is meant to house cut flowers but has become very wild and unruly! And did you notice our poor forlorn rhubarb which has certainly suffered in the lengthy dry conditions - just hope it recovers! We'll get round to tackling these soon but at the moment we are kept busy picking fruit, weeding where it is needed, cutting grass and most importantly having a chat and a cup of coffee with plot neighbours. After all there is always tomorrow! 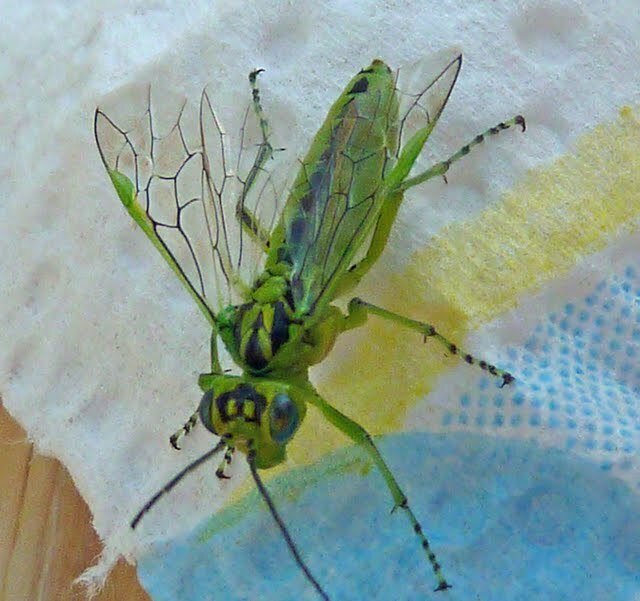 Can you identify this creature? This was found on my plot neighbours sweet corn - some sweetcorn leaves had been shredded but we don't know whether this was the culprit. I think it may be a green sawfly but that's just a guess.